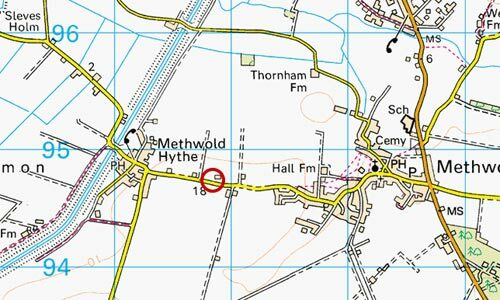 Methwold Hythe post windmill stood to the east of the village on the north side of the Hythe Road. The mill had a roundhouse and used a pair of patent sails to power 2 pairs of 4ft. French burr stones. A bakehouse was also run from the site. A POST WINDMILL with two Patent Sails, a Dwelling house, 12 Freehold Cottages and about 2 acres of Fine Arable Land to be Sold a Bargain. Apply to Edward Banham, Auctioneer and Estate Agent, Methwold. Lot 2. All that Post Windmill with roundhouse having 2 patent sails, 2 pairs of 4 ft.mill stones, iron shaft and the usual spur gear and 2 stone and tiled Cottages, Sheds and an excellent piece of garden ground containing about 1 acre (more or less). Further particulars of E. S. Copeman Esq. Solr. Downham Market or of the Auctioneer, Methwold. Patent Sails, French Stones, and Timber arising from the taking down of the above mill. Full particulars next week and will be sent by post. Mill in far corner of kitchen garden by road. Built before 1710, date of earliest deed held. Bakehouse to rear of house, ovens there till about 1940. Bronze bearing from site of mill found 1970.